The Government is keen to reiterate that it has already brought Tata Steel back from the brink of total closure in the UK but is the Indian-owned firm just "going through the motions" regarding a potential sale? A shock announcement from Tata Steel last week has led to an even more uncertain future at its UK sites. All options for portfolio restructuring are being examined including the potential sale of Tata Steel UK, in whole or in parts. The Government has been working on finding a long-term sustainable future for steel making across the UK, with a significant focus on Tata's blast furnace at Port Talbot, which was visited by under fire Business Secretary, Sajid Javid on Friday. Anna Soubry MP is in Rotherham today to meet with managers, workers, unions, MPs, local councillors and representatives of the Sheffield City Region LEP. The Minister of State (Minister for Small Business, Industry and Enterprise) told the BBC that the Government had found out about Tata's plan to close its UK loss-making operations and have been working on averting closure and helping to keep them open to find a buyer. A report in the Financial Times over the weekend had sources quoting that Tata had been trying to sell the Port Talbort site for 18 months and had not been able to find a buyer. It added that: "they have to go through the motions" regarding a sale. It is thought that Tata might consider keeping some of its speciality steel plants after it closes the bulk of its UK operations. Until recently, Tata Steel Europe employed around 2,000 steelworkers in South Yorkshire and their Aldwarke site is the focus for steel making, casting and rolling of specialist steels. Unlike at Port Talbot, this is produced via the more modern Electric Arc Furnance (EAF) steelmaking route using high quality recycled metal. In July last year, the steelmaker announced proposals for the next stage in its plans to refocus its speciality and bar business on high-value markets such as aerospace which included changes that has resulted in a reduction in employee numbers, mainly at its Rotherham-based bar business. Around 500 jobs were at risk with many employees working their last shifts last week. Anna Soubry talked of the future for Tata and steelmaking in South Yorkshire. She told the BBC: "I actually do think we will find somebody who wants to buy it as a whole. We don't want it to be sold off [in parts]. "I know that the specialist steels that they make in Stocksbridge and Rotherham actually are extremely high quality and there's every chance that they could be sold as an entity that could make money and be successful but what we want is to make sure that we have a package for the whole of Tata Steel in the UK - we think that's very, very important. "We know that there are people that are interested. Now we need to make sure we get the right deal - and that's for Tata to decide as they are a private company - but that we do everything we can to make it happen. "I very much hope that everyone employed in Rotherham and Stocksbridge today will continue to be employed in three months time and for the foreseeable future and there is a sustainable steel industry in both Sheffield and Rotherham." After his visit to Port Talbot, Sajid Javid reiterated the action that the Government has taken thus far including compensation on energy costs, flexibility on EU emissions regulations, tackling unfair trading practices in the EU and working to increase Government procurement of UK steel. 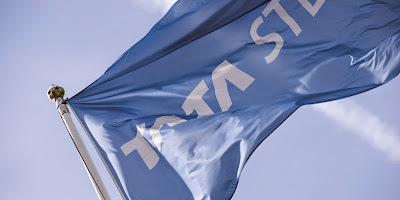 Roy Rickhuss, the general secretary of Community, the steelworkers' union said: "We need concerted action between the government and unions at a national level to ensure that Tata is a responsible seller and we secure a future for steelmaking in the UK. There are thousands of worried families right across the UK who are looking to the government to give them some hope. "We do not need more false claims from ministers that they have done all they can for the UK steel industry. This is quite clearly not the case when they are ring-leading opposition to Europe imposing higher tariffs on unfairly traded steel. I have lost count of the number of debates and discussions that we have had with government ministers over the past few years to warn them about the threat to jobs if there was no action to provide support and instil confidence in steel producers. "As for their claims that Government intervention helped to stop Tata Steel closing their plants, the ministers were well aware of the decisions being taken. The government should have been prepared for this announcement and ready to provide some reassurance to steelworkers, not just in Port Talbot, but right across the UK." Reforms to central government procurement have been extended into all public sector contracts so that public procurements that involve the supply of steel, will need to consider responsible sourcing, the training suppliers give to their workforce, carbon footprint, protecting the health and safety of staff and the social integration of disadvantaged workers. This will allow buyers across all major projects to take into account the true value of British steel, including its social impact. Contractors working for the public sector will also be required to advertise their requirements for steel so that UK firms can compete. Rotherham Council passed a motion in October that enabled the authority sign up to a charter that promotes the use of sustainable British steel in construction projects.